WASHINGTON – More than one in four of the estimated 154,200 immigrants who stand to lose their DACA protection in the next five months did not meet Thursday’s deadline to apply for a renewal, according to numbers from U.S. Citizenship and Immigration Services. The Oct. 5 deadline was set last month when the Trump administration announced plans for an “orderly wind down” of the Deferred Action for Childhood Arrivals program, or DACA, which defers deportation for immigrants who were brought to the U.S. illegally as children. Despite weekly “DACA drives” and other outreach efforts to try to get eligible recipients to apply for renewal, it still may not have been enough, said one Arizona organizer. 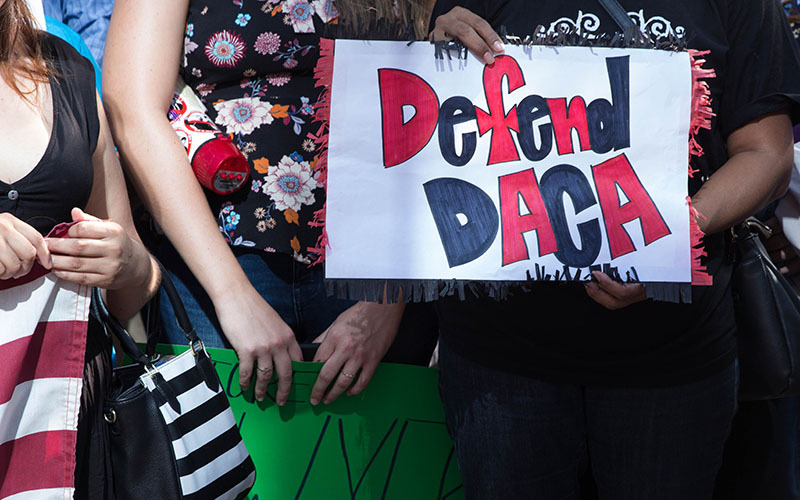 “I honestly don’t believe that we were able to reach as many as we would have liked to reach,” said Ayensa Millan, attorney and founder of CIMA Law Group in Phoenix, which participated in the DACA drives. That was despite drives around the Valley that helped “at least” a couple thousand people with forms and information, she said. An estimated 25,500 Arizona residents were eligible for DACA, according to a report by CIS, but the number who available for renewal by Thursday’s deadline was not immediately available. What happens to DACA recipients who can’t renew? The roughly 42,200 who did not meet the renewal deadline join more than 600,000 other DACA recipients who will see their coverage expire beginning March 5, unless Congress intervenes. The DACA program was enacted through executive order by President Barack Obama in 2012, after Congress failed to pass comprehensive immigration reform. Since then, the program has grown to protect roughly 800,000 immigrants from deportation for two-year, renewable periods, during which time they also receive work authorizations. The Trump administration said on Sept. 5 that it was revoking the program, calling it an example of executive overreach. But it said it would not begin revoking individual coverage until March 5, to give Congress time to come up with an alternative. Under the administration plan, no new DACA applications are being accepted. But anyone whose coverage was set to expire before March 5 was given until Oct. 5 to apply for renewal, which would be good for another two years. He told the Senate Judiciary Committee Tuesday that DHS will not make exceptions for people who miss the deadline, but that it will make exceptions for those in the U.S. Virgin Islands and Puerto Rico affected by Hurricane Maria on a case-by-case basis. DHS said that CIS had about 58,000 renewal applications pending on Sept. 5 and had received another 54,000 by Wednesday. Thursday’s deadline was also met with a lawsuit from CASA, an immigration rights group, that claimed the decision to end DACA was motivated by “unconstitutional racial animus” and that it violated the privacy of recipients who provided personal information to the government. “Despite repeated assurances that their information would not be shared with ICE (Immigration and Customs Enforcement), the administration is now backing away from those assurances, creating widespread fear in the DREAMer community,” CASA said in a statement Thursday. Since the administration’s Sept. 5 announcement, lawmakers from both sides of the aisle have proposed legislation to protect the 800,000 immigrants protected by DACA. While most seem to agree with the idea of giving some type of temporary legal status to DACA recipients, they differ on the details and on whether a DACA-replacement bill should include other elements, like tougher border security. Sen. Jeff Flake, R-Arizona, is a co-sponsor of the Dream Act, which would extend most DACA protections with the added benefit of giving some recipients a path toward citizenship. But he also introduced his own bill Thursday, the Border Security and Deferred Action Recipient Relief Act, that would give current DACA recipients conditional residence for up to 10 years with the chance to apply for a green card if they met certain criteria during that time. But he also included provisions to appeal to conservatives, adding funding for increased border security and interior enforcement, and subjecting members of gangs or cartels to deportation. “They may not lead with that … but I’ve had discussions already with some of my Democratic colleagues who I’ve worked with on immigration before and I do think that they can go for that,” he said.